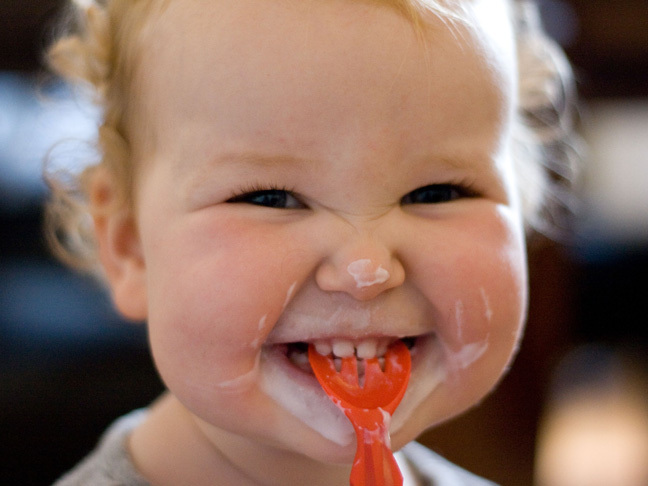 When Can You Introduce Yogurt to Your Baby? In our small Midwestern town, access to all of the wholesome, yummy foods that I like to serve my family can be somewhat challenging. Organic whole milk plain yogurt, which is a staple in our diets (and possibly my favorite food), is sold at one store within a 40 mile radius—which means that I regularly buy four quarts at a time when I find it in stock. (Yes, we eat it all before the sell-by date!) And with my youngest child starting solids soon, I’m already thinking through my strategy to keep enough of it on hand since I hope it’s a food that she likes as much as we do. And here’s the thing: In addition to being delicious, it’s a great early food for babies, says Wendy Sue Swanson, MD, a pediatrician and executive director of Digital Health at Seattle Children’s Hospital. “It has a smooth texture and often infants love the sweet flavor,” she adds. The American Academy of Pediatrics (AAP) recommends that babies start solids around 6-months-old. Although yogurt can be introduced at that time, the AAP adds that it’s best to wait until after your baby’s first birthday to introduce cow’s milk, because is harder for babies to digest. Additionally, cow’s milk doesn’t have the ideal mix of nutrients found in breast milk and formula, which babies should consume as their primary source of nutrition for the first year. Whole milk yogurt has fat, which babies need for proper brain development, according to the AAP, and it’s a good source of calcium and protein. Dr. Swanson recommends incorporating yogurt without any added sugar into a balanced diet of breast milk or formula, along with a range of fruits, vegetables, and meats (which can be replaced with other sources of protein, such as beans and lentils, if your family doesn’t eat meat). If you feed your baby yogurt and she develops vomiting, a rash, excess gassiness, diarrhea, or blood or mucus in the stool, stop feeding it to her and consult your pediatrician, says Dr. Swanson; your child may have an allergy to protein in cow’s milk. According to the National Institutes of Health, cow’s milk allergies aren’t common — only 2 to 8 percent of babies have one — but it’s important to check with your child’s doctor anytime you notice these symptoms. I plan to offer my baby plain yogurt with a little fruit or veggie puree stirred in to help mellow the flavor a bit. It took my oldest daughter a little time to learn to like the natural tang of plain yogurt, but now it’s a food that she likes so much she often asks to have it for dinner!